Al, Cambridge: For a direct goals comparison between Messi and Ronaldo it might be fairer to look at years in which they were both playing in the same league. That's where Messi is slightly ahead. But it's not just about goals is it? And they're both pretty fantastic in full flow! European football journalist Gabriele Marcotti: Ronaldo's hat-trick moves him past Shearer into 7th on list of all-time scorers in Europe's big 5 leagues (via @2010MisterChip). George: People need to remember that Ronaldo came to La Liga at his peak whilst Messi started his career there. With seemingly winnable games against Ludogorets and Almeria to come in the next week, you would expect Real Madrid to make it 20 straight wins before they head off to take part in the Club World Cup in Morocco later in December. It is of course still early days to be talking about further landmarks being reached (as Chelsea will testify) but you have to start wondering how many trophies this Real side can bag this season. And how many goals Ronaldo will end up with this campaign? Will is absolutely right. Lionel Messi has 53 more goals than Ronaldo in La Liga but he has been playing in the league for five years longer, during which he has played 112 games more. This is not to say Ronaldo is better than Messi, I'm not daft enough to wade into that debate. Lets just be grateful that we get to experience an era in which both of them are playing. Will Chambers: Ronaldo and Messi will always be compared, but it must be remembered that Ronaldo has not played as many games as Messi in La Liga. So, with 18 straight wins, Carlo Ancelotti's side have now matched the Spanish record set by Frank Rijkaard's Barcelona team in the 2005/06 season, and will have their chance to create more history on Tuesday when they face Ludogorets Razgrad in their final Champions League group game. The La Liga table shows Real Madrid now four points ahead of reigning champions Atletico Madrid and five ahead of third-placed Barcelona, who host Espanyol on Sunday. This was supposed to be about Real as a team. But instead we are again talking about their star man. He was clinical tonight, always in the right place and, once again, too hot for Celta to handle. He has now scored 200 La Liga goals in 178 games. He has 23 La Liga hat-tricks. Not bad son, not bad at all. An historic night at the Bernabeu, where Real Madrid have equalled the Spanish record of 18 straight wins in all competitions and Cristiano Ronaldo has broken the record for most hat-tricks in La Liga. They weren't at their best. They didn't need to be. They are four points clear the top of the table. The answer to that question is no. Nolito does not even beat the wall with his curling effort and Real clear. There are going to be three minutes of added time. Can Celta at least get a consolation from a Nolito free-kick from 25 yards? We are into injury time. This game is well and truly done and dusted. An air of contentment has descended upon the Bernabeu. Just to keep you abreast of further records Cristiano Ronaldo will inevitably break, he is now 28 goals shy of Raul's record tally of Real Madrid La Liga goals, which stands at 228. For the mathematicians amongst you, that means Ronaldo has brought up his double ton tonight. That deserves a raise of the bat. There will be no more goals for Ronaldo tonight. He comes off to a standing ovation to be replaced by Javier Hernandez. Opta Jose: Cristiano Ronaldo has scored in his last 17 home league games (29 goals in total). In amongst all that record breaking, there were a couple of changes, one for each side. Fabio Coentrao entered the game and replaced Karim Benzema for Real and Santi Mina came on for Michael Krohn-Dehli. There it is! Cristiano Ronaldo is on hand to finish a cross from Marcelo at the back post. 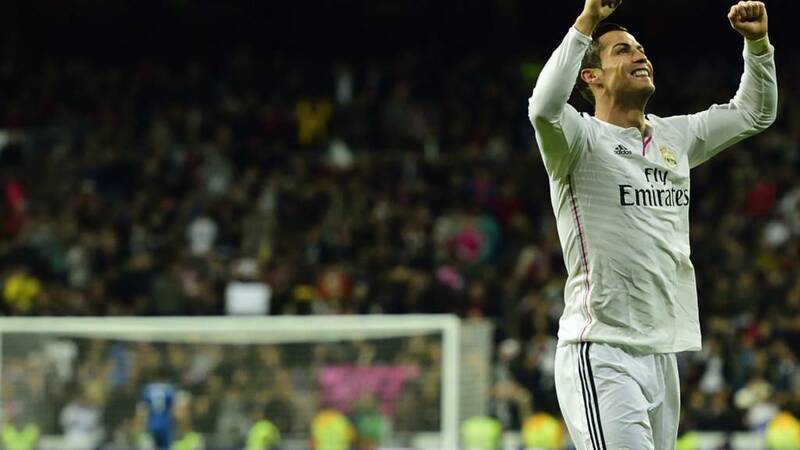 Another record for Ronaldo, who has now scored more hat-tricks than any other player in La Liga history. That is his 23rd. Yes, 23. It also means Real are now certain to equal the Spanish record for successive wins. All in a night's work for the (arguably) best team in the world. Another yellow card, this time for Real's Alvaro Arbeloa for giving away a free-kick near the edge of his own box. Nolito takes it and he is not far away, putting his curling shot just a yard past the post. Iker Casillas was scrambling. He was worried. Gareth Bale goes close for Real with a neat backward headed flick from a Toni Kroos free-kick. The effort is heading for the goal but is gathered by Sergio Alvarez before it can make it 3-0. And now Pedro Hernandez is booked for not retreating from a Real free-kick. That's cheap and totally unnecessary. Daniel Carvajal gets stuck in to a Celta man and is given a yellow card. The Real fans aren't happy but it was a definite booking, Real's second of the match. DeathApeDisco: Stats don't lie, Ronaldo is lethal in a way Ronaldinho never was. Eto'o was better than Benzema is though! With Madrid aiming to equal the Spanish record of 18 straight wins set by Barca's 2005-2006 side, we're asking who you think would win in a match between both teams at the height of their powers. Karim Benzema has not had much to feed on but when a chance does come his way he makes a bit of a hash of it. He looks to be away, with a Celta man for close company. He reaches the box and has a chance to shoot but chips the ball limply for the Celta keeper to save. Ex-Barcelona youngster Sergi Gomez comes on to replace Cabral, who is being carried round the pitch on a stretcher. The assistants flag has just rescued Celta. Cristiano Ronaldo looked to be away with just the keeper to beat, but he is pulled up, much to his frustration and Celta's relief. Meanwhile, Gustavo Cabral is still getting treatment behind the Real goal. Nolito is OK to continue, though, and takes the free-kick himself, which hits the wall and goes behind. The resulting corner is headed behind by a home man but now Gustavo Cabral after clashing with Sergio Ramos. He doesn't look in a good way. Off goes Fabian Orellana and on comes Augusto Fernandez. They have a free-kick for a foul on Nolito, which ended with the striker smacking his head on to the shin of Pepe. Real double their lead and it is that man Ronaldo again. Toni Kroos driving run forward is briefly halted but the ball bounces up off the head of Gustavo Cabral and on to the boot of the Real forward. The result: a volleyed goal. That is 28 for the season, 11 against Celta in just short of six games. If he scored again tonight he will have more hat-tricks than any other player in La Liga history. Just another little record for him to break. Unbelievable. Raj, London: It would be 5-5; both teams sensational going forward, nothing special in defence. Gareth Bale is presented with a superb chance to put Real firmly in control as the home side break through Ronaldo. The Portuguese forward finds Pepe, who then passes to Bale in space at the far post, but he takes a touch and opts for power not placement and Sergio Alvarez is able to save his angled drive. He should have taken it first time. He should have scored. Once again, a Real player gets in a superb tackle to deny Celta. this time it is Sergio Ramos diving in to deny Joaquin Larrivey a shot on goal and also deflect the ball off the striker to win a goal-kick. That is the kind of quality that helps you win 300 La Liga caps. Celta play some nice stuff when they come forward, but their final ball is just lacking. Either that or Real manage to get a superb last ditch tackle in to deny them. It is very much the latter as Carvajal sticks a boot in to stop Nolito getting a route through to goal. Gareth Bale has been a bit quiet tonight but he swings over a wicked ball from the left, which presents the Celta defence with a test, which they pass and clear. Soon after, the Welshman looks to get in behind the Celta defence but is flagged offside. Replays show he was probably level. Either way, his shot was wayward. James Rodriguez rolls his fingers round each other in the universal signal of needing to be subbed and so he departs to be replaced by Alvaro Arbeloa. He will drop in at right back with Carvajal moving into midfield. It may make Real more solid, but at the expense of creative flair... not that they lack that from elsewhere, mind. Real's first chance of the half is presented to Cristiano Ronaldo in the box by a chipped forward pass from Karim Benzema. Just before the Portuguese pulls the trigger to fire his shot over the assistants flag rises for offside against him. Joe: Barcelona of 05-06. Ronaldinho was just too good then, he could win it on his own. Prakash Gurnani: It will have to be Barcelona. Simple reason, Ronaldinho got applauded by Madrid fans in the Bernabeu. Would Ronaldo outshine Ronaldinho? Would Eto'o outscore Benzema? And would Kroos outpass Xavi? Let us know by using #bbceurofooty on Twitter or by texting 81111. Celta come forward again and Nolito makes his way into the box on the left before tumbling in the box under a challenge from Carvajal. It is not a penalty, though, and not even a corner as the ball came off the Celta man last. Sloppy stuff from Real Madrid at the start of the second half and it almost costs them as a cross from the left finds Fabian Orellana in acres of space, but the Celta player steers his shot just past the far post. That is a let-off for Real. Opta Jose: Real Madrid midfielder Asier Illarramendi attempted more passes than any other player in the first half - 34. The second half is under way. What have Celta Vigo got to throw a spanner in Real Madrid's record-equalling aspirations? Opta Jose: Cristiano Ronaldo has scored six of Real Madrid's last seven league goals against Celta Vigo. He has also now scored 10 in five-and-a-half games against Celta and has scored in every La Liga game in the Bernabeu stretching back over a year. This is becoming a familiar sight - the Real Madrid players embrace in celebration at yet another Cristiano Ronaldo goal. Do you get the impression that Celta Vigo are a little bit annoyed at the awarding of that penalty? Jared Maobe: I thought mediocre refereeing was a preserve of the Premier League, but it is even in Spain! That was a dive by Ronaldo, not a penalty. Real are on course for a Spanish record-equalling 18 straight wins courtesy of Cristiano Ronaldo's controversial penalty, awarded for the slightest of nudges on the forward by Jonny Castro. Real have been the better side, but they have not been at their flowing best. Regardless, it is up to Celta to produce something now, otherwise this Real machine will march on into the record books. Nolito swings the ball in but Toni Kroos is able to clear with a header. And that is your lot for the first 45 minutes. Pressure is on Celta now to make something happen. Michael Krohn-Dehli's shot from the edge of the box is deflected behind but Nolito's corner is dealt with well by the home defence. Tell you what, if Ronaldo's penalty was a harsh call on Celta, they could have had no complaints if one had just been given for a clear foul on Gareth Bale in the box. the Welshman was wrestled to the ground as Toni Kroos swung over a corner. Luckily for Celta the ref and his assistants didn't see it. It is almost 2-0 to the home side. Marcelo cuts past a man on the left byline and has time to fire a low cross across goal in the direction of Karim Benzema, but Jonny gets in there first to clear. James Rodriguez kicks out after being felled and picks up a yellow card. The Colombian then draws a good save out of Sergio Alvarez with a low shot from the edge of the box. Jonny was not the only man to pick up a booking during the Celta protests. Nolito was also carded. You can see their point as well, as Ronaldo made a lot of very minimum contact from Jonny to win the penalty. There were hands on his back, but enough to fell him? I doubt it. Cristiano Ronaldo makes no mistake from the spot, sending the keeper the wrong way and stroking the ball into the bottom left corner of the net. That is 27 for the season for the 29-year-old. James Rodriguez was amongst the goals midweek in the Copa del Rey and he almost had himself another with a shot on the turn that is just too close to Sergio Alvarez. The keeper dives and saves. Celta have survived 30 minutes. They've not offered much but they haven't been completely under the cosh either. Real need to move to ball quicker if they are to break down a well-drilled away side. Celta are just hoping to be able to spring that one decisive break. Ronaldo's spectacular bicycle kick is the closest we have come to a goal so far. Ronaldo almost makes Celta pay for being so picky with a low shot from just inside the box that is heading for the bottom corner until Sergio Alvarez gets down to save. Celta enjoy their longest period of possession of the game so far. They have a couple of chances to shoot from the edge of the box but they spurn each in favour of seeking out a better opening that never comes. Pull the trigger lads, you won't score otherwise. Gareth Bale wins the battle to take the first free-kick but wastes it by driving it way over the bar. I suspect Cristiano will be taking the next one. Real pose a serious threat from corners. Toni Kroos swings over another wicked delivery, which is met by Sergio Ramos with a header that goes just over the bar. Celta survive again. Celta have done OK in the first 20 minutes here. They haven't conceded and have looked to be positive in the rare moments they have had in the Real half. Nolito looks to create something for the away side but he cannot steer his pass from the left anywhere but behind for a goal-kick. James Browning: Barcelona without a doubt, Ronaldinho, Eto'o, Puyol etc were incredible! With Madrid aiming to equal the Spanish record of 18 straight wins set by Barca's 2005-2006 side, we're asking who you think would win in a match between both teams at the height of their powers. Tweet #bbceurofooty or text 81111. Superb effort from Cristiano Ronaldo. It is almost a stunning goal as the Portuguese rises to connect with a bicycle kick on the edge of the box and send the ball just a yard over the bar. It was Rooney against Manchester City-esque, but without the true connection. Celta come forward again, and in numbers as well. A smart passing move ends with Pedro Hernandez chipping a pass just a touch to heavily over the top and behind. Celta have their first real venture into enemy territory but Michael Krohn-Dehli is crowded out 25 yards from goal. And we are immediately back to Real in possession, probing for an opening. A superb tackle from Jonny Castro denies Cristiano Ronaldo what would surely have been a goal. A quick counter-attack releases James Rodriguez and his cross looks to have teed up Ronaldo for a shot on goal before Jonny's sliding intervention denies him. Take a bow son. Gustavo Cabral goes into the book for a sliding tackle on James Rodriguez, which leaves the Colombian on the turf. Real then force a couple of corners but the away defence holds firm to clear a couple of probing crosses. Unsurprisingly, Real are bossing possession. They attack again down the right and Carvajal digs out a cross for Ronaldo, which is intercepted by a Celta head. The resulting corner is headed down by Ronaldo and saved by Sergio Alvarez, giving Sergio Ramos a clear sight of goal but somehow he slices his shot wide. Real should be ahead. Gareth Bale and Cristiano Ronaldo again look to combine but the former's low cross is cut out by the diving Sergio Alvarez at the feet of Ronaldo. Real are slowly building up a head of steam. Stuie Neale: I would say this current Real team would beat 05-06 Barcelona. And there is our first real sight of Cristiano Ronaldo, who cuts the byline on the right and chips over a cross, which is just too heavy for Gareth Bale to reach a boot out for and steer towards goal. Gareth Bale is into the action early on, breezing past a challenge before digging out a cross, which flies across the box and out for a throw on the far side. Going back to our Twitter question, I'm torn over who would win between this Real side and the Barca one from 2005/06. I'm tempted to think Barca would edge it by virtue of having a stronger defence. It'd be a close thing, though. It'd be like the Mega Powers explode at Wrestlemania V.
The home side get the match under way. Game on. Here is something a bit different... Magnus Carlsen, who was crowned world chess champion for the second year in a row last month, is just conducting an honorary kick-off ahead of today's game. The Norwegian is a huge Madrid supporter, and this is his second time performing the act, having also done it last year ahead of the La Liga game against Valladolid. Carlsen must feel like a king right now. Or at the very least a rook. Ibrahim Urooj S: Real Madrid would win against that Barca side, hands down with daggers on both flanks and a reliable bench. There's not a single weakling on this team. OptaJose: Celta have failed to score in 3 successive La Liga games; the last time they went 4 or more without a goal was in 1995 (5). Drought. It all looks pretty ominous for Celta Vigo. But Eduardo Berizzo's side do have some cause for optimism (a tiny, slim cause), not least of all their impressive away record in La Liga this season. They have only been beaten once in six away games - this includes a 1-0 win against Barcelona in the Nou Camp and a 2-2 draw at reigning champions Atletico Madrid. Unsurprisingly, Real appear keen to retain the services of the man who has masterminded their recent success, Italian manager Carlo Ancelotti. According to Spanish paper Marca, the club has offered Ancelotti and an improved one-year extension to his current deal. The paper also reports that Los Blancos are closing in on the signing of 21-year-old Brazilian midfielder Lucas Silva from Cruzeiro. He will join up at Real with 18-year-old Marco Asensio, who joined from Real Mallorca this week. The present is taken care of, time for Real to look to the future. It wouldn't be a Real Madrid text commentary without making special mention of that Cristiano Ronaldo fella. You know the one; scores goals, wins trophies, flexes his thighs for the cameras. As I've already mentioned, the Portuguese forward has bagged 28 goals in 22 games in all competitions this season. He has also scored in every game at the Bernabeu in La Liga stretching back over a year. Clearly he is prolific against every team but he is particularly ruthless against Celta Vigo, who have faced him five times, failed to prevent him scoring in any of them and conceded nine in total from the 29-year-old. Last season, in this fixture, Ronaldo scored twice in a 3-0 Real win. One comparison between the Real side of now and the Barca side of 2005/06 is the presence of a stalwart at the back. Barca had Puyol, Real have Sergio Ramos, who tonight will make his 300th La Liga appearance for the European champions. Celta Vigo: Sergio, Mallo, Cabral, Fontas, Jonny, Radoja, Hernandez, Krohn-Dehli, Orellana, Nolito, Larrivey. Real Madrid: Casillas, Carvajal, Pepe, Ramos, Marcelo, Kroos, Illarramendi, Rodriguez, Bale, Ronaldo, Benzema. #bbceurofooty. You can also text us on 81111. So yeah, get stuck in. Do it. Do it now. To kick things off, try chewing this over: who would win in a game between this Real Madrid side and the Barca side of 2005/06, who won 18 successive games? If Real win tonight, their 18th victory on the bounce will match the Spanish record set by Frank Rijkaard's Barcelona, who won 18 games in a row between October 22, 2005 and January 26, 2006. As if the incentive wasn't big enough already, they also have the chance to stick it to old rivals Barca tonight. As the amphibian Tiny Tim sang in Muppets Christmas Carol, 'tis the season to be jolly and joyous. This is especially the case of you are a Real Madrid fan. They have 17 successive wins in all competitions (a new club record), with an average of nearly four goals a game, they're top of the league, top of their Champions League group and cruising through the Copa del Rey with their reserves. Things are so good, they can even send on player who has been out injured for nine months and he scores within 20 minutes. Yep, it's promising to be a very merry Christmas for Real Madrid.